NOW HERE!! Your home for great tone! Our normal hours are 3:00PM-6:30PM Monday,Tuesday,Thursday and Friday,3:00PM-5:15PM Wednesday,and 11:00AM-3:00PM Saturday and CLOSED Sunday. If you have any questions or concerns,please give us a call,send an email at info@redstickguitarandamp.com or check us on Facebook and Instagram. Thanks!!!! 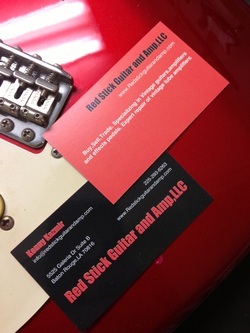 Welcome to Red Stick Guitar and Amp! Baton Rouge’s source for great vintage and used guitars, amps and effects. Offering a selection of electric and acoustic guitars as well vintage and modern tube amplifiers, we also have an extensive collection of vintage and boutique effects pedals. We are also interested in buying and trading for good used and vintage gear. We offer tube amp repairs such as Electrolytic Capacitor replacement and Bias Adjustment, to full-on electronic restoration. We can also assemble your amplifier kits as well. We can custom order any Mojotone head or Speaker cabinet as well as Mojotone's extensive line of Kit Amplifiers. We carry a wide variety of NOS and new production tubes for many common and uncommon American and Foreign Valve amps,such as:6L6,EL34,6550,EL84,12AX7,EF86,12DW7,6AU6,6X4,GZ34 and MANY others. We will offer service such as restringing, cleaning and full,4 step complete set-ups on guitars and basses. We can install and customize your pickups with highest quality parts. We keep Bone saddle and nut blanks as well as Graphtech Tusq man-made Ivory nuts and saddles in stock. We can offer the finest partial and full refrets along with leveling and crowning and can supply any current and NOS fretwire in any size available. We build Custom guitar cables made from high-quality Mogami 2524 cable and Made in the USA G&H plugs,in lengths from 1 ft to 100ft. Visit us on Facebook@Red Stick Guitar and Amp,LLC and on Instagram@red_stick_guitarandamp.com.We regularly offer up some pictures of recent work there and a little humor too! We are dealers for GHS strings,Satellite amps,Mojotone parts and kits,Antique Electronic Supply, Celestion, and Eminence.. Thanks for stopping by and supporting a local small business!!!!!! !